Capsule have been invited to curate a festival of new music and performance as part of Appetite in Stoke-on-Trent. Appetite’s mission is to get more people in Stoke-on-Trent to experience and be inspired by the arts, working with a range of local and national artists and communities to deliver an expanding menu of artistic projects to develop the appetite for the arts. 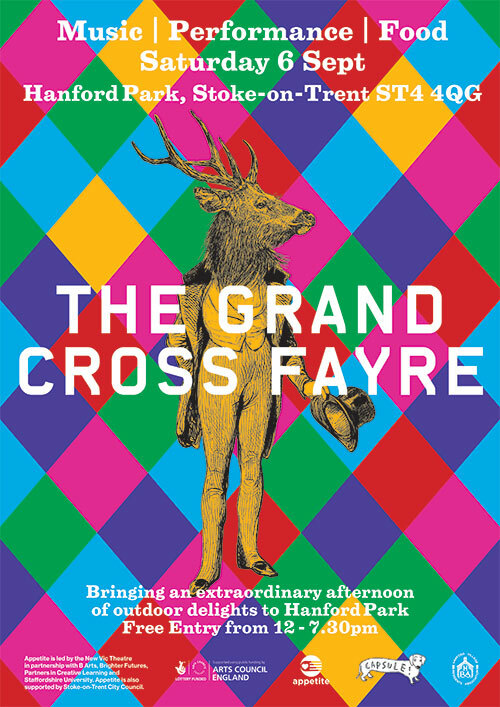 The Grand Cross Fayre will be taking place on Saturday 6 September in Hanford Park and will include live performances from James Blackshaw, White Manna from California and Rattle to name but a few as well as workshops led by artist duo Juneau Projects and the costumed Swoomptheeng . An array of Street food, vintage stalls and more to entertain! James Blackshaw – We Who Stole The Dream from esther may campbell on Vimeo.